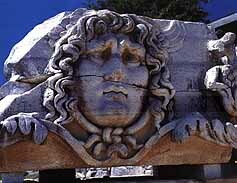 Didyma was an oracle center of antic ages. The holly road beginning from Miletos' holly door lays to Didyma's Panarmos port, and continues to the south then reaches to Didyma temple's vow terrace. By the end of this road there are sitting men and lian statues. Made a township in 1991, Didyma is a peninsula surrounded by the provincial limits of Mugla and the Akb�k cove in the east, the Aegean Sea in the south and west and the lake Bafa and the river Meander in the north. It is located 106 km from Ayd�n, 53 km from S�ke, 73 km from Ku�adas�, and 110 km from Bodrum. The number of its inhabitants is 10.400 accoring to the census of 1990, and its area 300 km2. Didyma possesses a bed capacity of 15.000 in 200 facilities either certified by the Ministry or by the Municipality. There are a lot of invaluable historical sites, ruins, ancient cities and recreational facilities by the seaside in and around Didyma which make the region a world-known tourism centre. This shows that Didyma is a town of history, legends and nature with the Dilek peninsula on one side and the Meander delta and the Dilek peninsula on one side and the Meander delta and the take Bafa on the take Bafa on the other. Having a coastal line of 60 km Diduma furthe has hundreds of coves. Didyma is an ideal holiday resort for those who like aquatics. fishing, trekking, youth and student tourism, hunting, healthcare, historical works, sea sun and nature. The colours created by the setting by the setting sun over the sea at Alt�nkum are not those that can be seen elsewhere. You can enjoy with much satisfaction that moment with a goblet of drink at any restaurant by the seaside. Alt�nkum, Didyma is an excellent resort for those who would seek for the sea, sun and sand. You can have a sun bath on on golden sandy beaches, participate in aquatics in the coves where any kinds of such sports can be performed. When the sun start to set. Alt�nkum gains a neddish colour. Later than that hour, you can have dinner at hundreds of restaurants that serve the turkish and various other cuisines from all ower the world. And alt�nkum, which looks small and quiet awakens in the evening. As the time goes by, you can see that people start dancing and chatting at the bars. If you are unable to slow down in the later hours of the night, you can dance in one of the discos which will entertan you until the morning. That is not all. You can also nide a bicycle to see the bars. If you are unable to slow down in the later hours of the night. You can dance in one of the discos which will entertan you until the mornig. That is not al you can also ride a biycle to see the coves and historical sites around the place. Besides the sea and sun on one side and the endless golden beaches on the other. historical and artistic wonders rie everywhere.